Star of “Shooting Stars” (BBC2), “Dave’s One Night Stand” and Channel 4’s “The Angelos Epithemiou Show”. 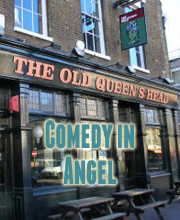 The comic creation of Dan Skinner, Angelos is perhaps the best know cafe owner and plastic bag enthusiast in comedy. A bit favourite of ours who’s debut hour “Dark Horse” was one of the smash hits of the Fringe in 2018. Star of Channel 4’s Friday Night Dinner, ITV’s Plebs. As seen on Drunk History, Horrible Histories and Broadchurch (he probably wasn’t being funny in that).